There is power in knowledge! This blog is full of information so every pet owner will be well informed. This way they can make an educated choice not a fear base one about the health of their pet. Diatomaceous Earth (often referred to as "DE") is an off white talc-like powder that is the fossilized remains of marine phytoplankton. When sprinkled on a bug that has an exoskeleton (such as bed bugs, ants or fleas) it compromises their waxy coating so that their innards turn into teeny tiny bug jerky. But it doesn't hurt mammals. We can eat it. We do eat it! It's in lots of grain based foods because lots of grains are stored with diatomaceous earth to keep the bugs from eating the grain! Food grade Diatomaceous Earth one teaspoon per day for small dogs and 1/2 teaspoon for puppies. For external parasite control, simply rub the powder at full strength into the coat for fleas and sprinkle on bedding. Learn how to apply the D.E. and learn the benefits of it! Pumpkin seeds can be fed whole as a treat for your dog. Don’t feed him the salted seeds from the grocery store; find some raw, organic green seeds instead. If your dog doesn’t enjoy them as a treat, you can grind them in a coffee grinder or Magic Bullet and add them to his meals. Give him a teaspoon per ten pounds of body weight once or twice a day until he’s rid of the parasites. by Dogs Naturally Magazine in Featured Articles, Nutrition And Diet. Looking back at the historical diets of dogs and their wolf ancestors, it is clearly evident that they are carnivores. Their teeth, gut and digestive physiology strongly support this. Dogs have hinged, powerful jaws along with canines and triangular shaped carnassial teeth for the ripping and tearing of flesh and crushing of bone. Nature's own miracle food! Raw green tripe is one of the best additions you can make to your pet's diet. Whether or not you feed a balanced raw food diet, homemade meals or commercial kibble; there are many amazing benefits to this smelly, healthy food! Do you know what a Titer Test is? Shockingly, many pet owners have no idea! A titer test is a laboratory or in-house veterinary test measuring the existence and level of antibodies (necessary to fight off disease) in your pet’s blood. Basically, it’s a test that will tell you whether or not you actually need to vaccinate your pet. Because of what can happen if you over-vaccinate your pet! “Vaccinosis”, the name for the chronic disease, is caused by continued use of vaccines. These symptoms mimic the original disease in parts. The most basic method for a titer is where your pet’s blood is drawn and sent away for testing. It ranges anywhere from $150 to $200. The most affordable method is the new “in house” testing procedure. This test is preformed at the vet clinic and it takes about 20mins to get the results. The price range is anywhere from $60 to $80! delivered to a staggeringly large percentage of dogs and the reason is not to protect your dog: the reason is to protect these facilities against liability. 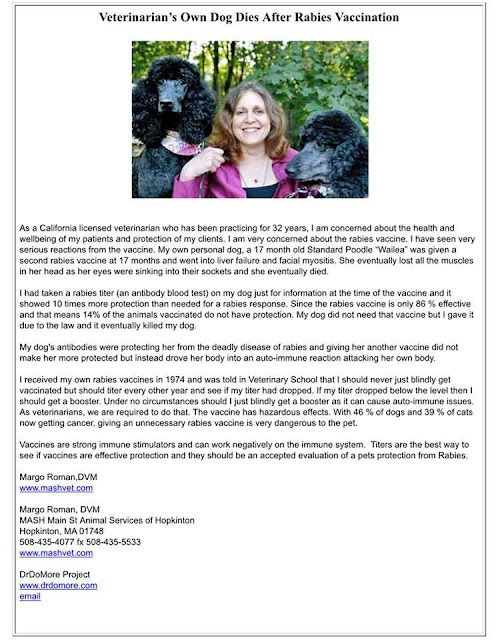 Many holistic veterinarians believe vaccinations are the direct link to the chronic diseases we see in dogs today. Does Your Dog Really Need the Kennel Cough Vaccine? Dogs and cleaning products don’t mix! Do You Make This Cancer-Inducing Pet Care Mistake? Where There Are Pets… There Will Be Accidents" Soiling and vomiting accidents happen. As a pet parent, it comes with the territory. But just because you share your home with your furry best friend doesn’t mean you have to live with embarrassing stains and odors. Especially now with this non-toxic pet stain remover that will erase the telltale signs forever. A week ago today our beautiful Hungarian Vizsla Ruby died. She was just seven. Losing a beloved family dog is utterly terrible, but our grief is compounded by the fact we might have been able to save her, had we known about xylitol. By using this site, you signify your assent to this disclaimer. If you do not agree to this disclaimer, please do not use the site. The information in this web site is presented for the educational and free exchange of ideas and speech in relation to health and wellness only. It is not intended to diagnose any physical or mental condition, or to prescribe or promote any particular product(s). It is not intended as a substitute for the advice and treatment of a licensed professional. In the event that you use the information for your own health, or for your animals, you are prescribing for yourself or your animals, which is your constitutional right and for which the author of this site assumes no responsibility. The author of this website is neither a legal counselor nor a health practitioner, nor a veterinarian and makes no claims in this regard. Reference or links in this web site to any non-government entity, product, service, or information do not constitute endorsement or recommendation. Statements about products and health conditions have not been evaluated by the Food & Drug Administration. Products are not intended to diagnose, treat, cure, or prevent any disease. All material provided in this site is provided for educational purposes only. The information provided may not be relied upon for diagnosis or treatment of any disease or medical condition. Seek advice from your health care professional regarding the applicability of any information, opinion or recommendation for diagnosis or treatment of any symptoms or medical condition. The information on this website is presented for educational purposes only. It is not intended as a substitute for the diagnosis, treatment, or advice of a qualified, licensed medical professional. The facts presented are offered as information only, not medical advice, and in no way should anyone infer that we are practicing medicine. Seek the advice of a medical professional for proper application of this material to any specific situation. No statement on this website has been evaluated by the Food and Drug Administration. Any product mentioned or described on this website is not intended to diagnose, treat, cure, or prevent any disease. If you purchase anything through a link in this email or website, you should assume that we have an affiliate relationship with the company providing the product or service that you purchase, and that we will be paid in some way. We recommend that you do your own independent research before purchasing anything. The facts I have presented are offered as information only, not medical advice, and in no way should anyone infer that we are practicing medicine. Seek the advice of a homeopathic veterinarian for proper application of this material to any specific situation. Any product mentioned or described in my statement are not intended to diagnose, treat, cure, or prevent any disease. If you purchase anything through a link in this post we recommend that you do your own independent research before purchasing anything and contact a certified homeopathic veterinarian. Thank you for your understanding.